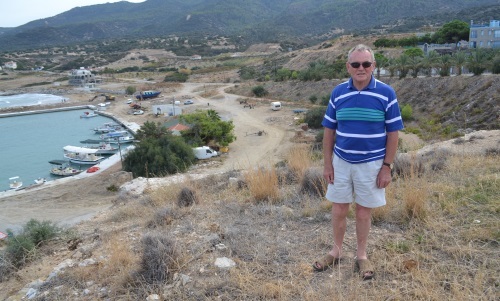 I recently enjoyed meeting a Welch Regiment Cyprus veteran, Brian Taylor, who was visiting Cyprus with his family for a holiday and to re-trace his experiences as a young National Serviceman in 1957/58 when he was posted to Cyprus. Brian spent time in Aberdeen Camp (Xeros), Kaplica (Dhavlos) and Buyukkonuk (Komi Kebir) during his time in Cyprus and we joined him to share his memories and wrote about the lovely day out we had with him, his daughter and son-in-law when we visited the areas where he had been stationed in Dhavlos and Komi Kebir. The link is shown at the end of this article. “My Pontypridd-born father enlisted into the Second Battalion of The Welch Regiment in Cardiff as a Band Boy at the age of 15. 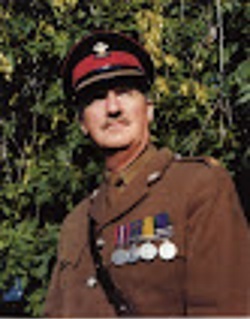 He was soon transferred to the First Battalion in which he remained, bar a short transfer to the East Lancs to receive a commission, until he retired at the end of his service in 1962. 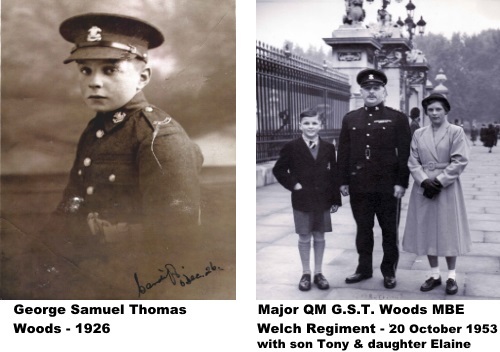 – Major George Samuel Thomas Woods MBE, 1911 – 1994. My father was a career soldier in the Welch from Band Boy to retirement but missed out on the posting to Cyprus. While stationed at Pembroke Dock in the late 50s I joined him and stayed with Major Dicky Randell and his lively family – a great holiday. I really enjoyed reading the following story which was written by another long term member of the Welch Regiment – Major Bob Smith, sadly now deceased, and felt I would like to share this following our recent nostalgic trip to the same areas. Having made contact with the Major’s daughter, Gilly, she was happy to give permission for this to be reproduced on our website and I hope you enjoy reading this as much as I did. The telephone crackled at Battalion Headquarters in Dhavlos [Kaplıca] and a far distant voice could be heard saying, “Do you want to buy a horse?” It was Major Dicky Randell who commanded ‘A’ Company based near the village of Akrades [near Yeni Erenköy] way out on the Karpas peninsula of north east Cyprus. Dicky’s thoughts were never far away from horses and many of us in the Regiment wondered why he had bothered to join a ‘foot slogging outfit’ when he would have been far more at home in a Cavalry regiment. We all liked his company though, and we appreciated the gentle way in which he approached his problems with, what he called, ‘horse sense’. The task of the 1st Battalion The Welch Regiment in those days of the ‘mid fifties’ was to keep order among the Greek Cypriots who wanted union with Greece, and to act as a buffer between them and the Turkish Cypriots who, on frequent occasions, would get quite annoyed with the Greeks for upsetting their quiet lifestyle. When we were not chasing gangs of Greek Cypriot ‘EOKA’ ‘Freedom Fighters’ around the pine clad mountains, or waiting in ambush positions on known ‘bandit runs’, there were plenty of opportunities for enjoying ourselves. Every Company had its own football and basket/volley ball pitches, and those that were near the sea had first class swimming and sub aqua facilities. Those of us who were fortunate to be at Battalion Headquarters had just about everything to keep us happy, albeit in a monastic way. For this, we had to thank a certain Commanding Officer of a unit who had been there three turns behind us, who decided that the morale of his staff was far more important than any tactical factors concerning the positioning of Battalion Headquarters. The place was like a holiday camp. In the centre of the complex of tents and barbed wire was the Louis Hotel, a strange circular building that looked more like a lighthouse than a hotel. It used to attract the odd adventurous visitor before the State of Emergency was declared but, when we were there, it was requisitioned and used as the Commanding Officer’s HQ, and senior officers’ quarters. We had a full range of sports pitches and, best of all; we were camped fifty feet or so above the sea where we looked across to Turkey and the distant Toros Daglari mountain range. The swimming facilities were superb. For the sub-aqua enthusiast, there was deep, crystal clear water and plenty of fish, and for those of a timorous disposition, a gently sloping bay of golden sand. A rocky out-crop, five hundred yards out in the bay, dubbed ‘Taff’s Isle’ (which looked remarkably like a submarine), was a challenge for our long-distance swimmers. Just below the Officers’ Mess was a stone building, also requisitioned, which we used as a boathouse. It contained a few dinghies on loan from the Cyprus Forces Sailing Club. Alongside the boathouse was another building that we had turned into stables. The loose boxes accommodated two fine desert ponies that I had recently purchased from a Royal Air Force unit in Benghazi, in Libya, for £5.00 each. I actually bought three ponies, but one of them died of colic on the landing craft that brought them over. Many of us would have been quite happy to follow the example of the crew of the ‘Bounty’ and sever our connections with civilization. Dicky Randell had obviously been thinking of ways to further improve the splendid conditions under which we lived when he rang me and asked if I wanted to buy another horse. It was difficult to get a verbal profile of the animal on the crackling line, but I managed to gather that it was in good order and a bargain at £15.00. Dicky’s recommendation was good enough for me and we came to an understanding that he would advance the money for the horse. I could just make out that he would deliver the beast, by truck, the following day, to a place called Khomi Kebir [Büyükkonuk], where the tarmac ended. The following day I set off on the six-mile journey to Khomi Kebir with two Land Rovers and six soldiers, who were armed to the teeth in case we came upon some terrorists on the way. We reached the rendezvous ahead of the other party from Akrades, so we did what most Cypriots do in the summer; we drank coffee and ate nuts and cheese in the cool shade of a carob tree. We didn’t have to wait long before we heard the unmistakable whine of the engine of an Army 3-ton truck labouring up the hill in second gear. 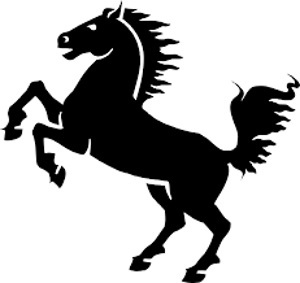 As it came around the corner into the main square of the village, a few comatose Cypriots blinked at the sight of a large horse whose head was sticking out above the canopy frame. I must admit that I was surprised as well at the size of the horse, and I wondered if the girth and bridle straps that I had brought with me were going to be long enough. I had become used to the relatively small size of Middle East horses compared with those of north western Europe. Fourteen hands was about the average height, but this monster in the back of the truck was over sixteen hands high. I had already made a reconnaissance of the village to find a suitable off-loading point, and I was able to guide the vehicle to a place where the tail board could be laid flat on a bank. When this had been done, and after I had tested it to make sure that it would be safe for the horse to cross over, I signalled Shakey to proceed. After a few prods and pushes the animal stood on firm ground. So far, so good. The next stage was to get the bridle and saddle on. I started to undo the buckles and at the same time I asked Shakey what the animal was like to ride. I had to stand on the chassis of the Land Rover to reach the horse’s head, and as I slipped the headband over his ears, I was aware of the dark depth of one eye as it looked hypnotically at me. The saddle was next, with a suitably lengthened girth, and then I was ready to get aboard. I asked one of the soldiers to remove his shirt and this was draped over the animal’s head so that I could, at least, get settled in the saddle before I knew how he would react. One foot in the stirrup, a hefty shove from Shakey and I was up in the saddle and, so far, in command. Now came the moment of truth, and I gave the order to remove the blind-fold. The bare buff soldier reclaimed his shirt and the others, who had been holding on to the bridle as if the horse was a tethered barrage balloon, leapt out of the way. They need not have bothered as the animal stood as still as the most disciplined quadruped on Horse Guards. The ‘calm before the storm’, I thought as I put some gentle pressure with my calves, but still no response. The soldiers were beginning to snigger, so the time had come to take some positive action. I reached up into a tree, snapped off a stick and gave him a tap on the rump. Still no response. A harder slap, and then he started to move, but only at a slow walk. Shakey and his team had raised the tailboard of their vehicle and were ready to return to Akrades. They watched me as I ambled off slowly in the direction of Battalion Headquarters. I had the prospect of a six-mile ride on a horse that instead of being a ball of fire turned out to be a damp squib! I developed a rhythmical motion with my legs and my stick to keep the horse moving, and, in this fashion, we slowly progressed along the narrow road, with the Land Rovers moving in bounds in front and behind me and stopping every few hundred yards so as not to over-heat their radiators. We had covered about a mile in this way, when around the bend in the road, about 150 yards ahead, appeared a Cypriot sitting on a donkey and leading another one behind him. 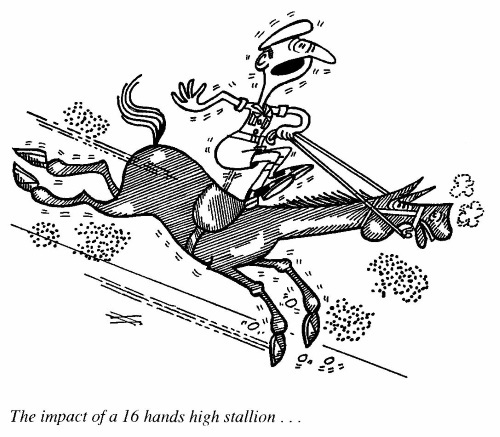 The effect upon my horse was as if someone had given him an immense electric shock. From a gentle walking pace, I was suddenly catapulted into a breakneck gallop as the animal hurtled down the track in the direction of the unsuspecting Cypriot and his two donkeys. I was quite unable to control the horse and it was obvious there was going to be a tremendous collision. The impact of a sixteen hands high stallion upon a Cypriot donkey, not much bigger than a Shetland pony, was a bit one sided. The old man came off at the moment of strike and rolled underneath the donkey he had been riding, while his steed, which turned out to be a female, was ‘mounted’ by my stallion. What I had not been told about the horse was that it had been used solely for stud purposes. The sight of any donkey, horse or mule drove it into a frenzy. If it was a female it had to be ‘mounted’ and if it was a male, it had to be ‘destroyed’. The soldiers in the Land Rovers had watched my ‘attack’ upon the unfortunate Cypriot and his donkeys with amazement, and they assumed that I had spotted something that they had not seen. As I was trying to get my horse off the donkey I could see them racing up the track with their rifles at the ready. I prayed that they would not shoot the old man who was somewhere under the writhing mass of horseflesh and add injury to insult. I must have been able to get through to them that it was a purely sexual matter, and nothing to do with terrorism, as they put their rifles down and helped the old man to his feet. They dragged the donkey away from the stallion, whereupon it shot over the side of the cliff and joined the other one that was going as fast as its legs could carry it for the sea, about two miles away. Turkish Cypriots are made of strong stuff and the recovery of this one from a state of shock was swift. Within a matter of seconds, he was leaping up and down in his voluminous black knee breeches, gesticulating wildly in the direction of his run-away donkeys. The soldiers had a ‘whip round’ for him and managed to collect a few packets of cigarettes, which he grudgingly accepted. I did my best to apologise, but he just shook his fist at me and gave a ‘five fingered curse’ to the stallion. At this stage of my ownership of Satan, for that was his name, I did not realise that an identical reaction would take place every time that he saw an animal of his own species. I was therefore only slightly prepared when we met the next donkey borne Cypriot coming towards us. He was more fortunate than the first one as we had descended to sea level, and his donkey summoned all its reserves of speed to escape from the carnal onslaught. Except for the two sudden bursts of speed, the journey from Khomi Kebir to Dhavlos had been very boring and we had taken about one and a half hours to cover six miles. I was therefore pleased to see our camp in the distance and, as we got closer, the sight of the white tunic of a mess waiter on the patio of the Officers’ Mess reminded me that I was very much in need of a cold beer. I walked Satan through the transport park and handed him over to my batman. I gave him instructions to feed and water the horse before I climbed up the path to the bluff of high ground above the stables and the boathouse where the Mess was situated. Most of the officers were standing around having their drinks before lunch, and the Commanding Officer asked me what I thought of the new horse. I told him what had happened and everyone had a good laugh at my expense. All of a sudden there was a commotion outside and I recognised the voice of my batman. I bounded out of the Mess and flew down the cliff path to the stables where I found the place in a shambles. “Whatever has happened?” I asked. One of the other batmen explained that Satan had been taken into one of the stalls where he had been given a large pan of oats and a bucket of water. “Good as gold he was,” said the batman, “Until someone brought in one of those desert ponies, and then all hell was let loose.” I recognised the same trouble that I had experienced twice myself that morning. I looked at the damage he had caused and calculated that it would take a few day’s work and a number of large whiskies for the Quartermaster before the stables would be restored. Even an inexperienced person could see that Satan had been kept on basic survival rations. Big hollows in his side showed how he had been underfed, and I realised that he would need more than the normal rations for a horse of his size to build up his strength. 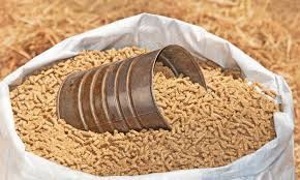 What I had not appreciated was the enormous capacity that he had for oats. Instead of a throat and a stomach it seemed that he had a ‘black hole’ down which everything disappeared. One advantage of giving him this ‘high octane’ diet was that his performance as a hack improved considerably and I spent many enjoyable hours riding him on the beach and the countryside around Dhavlos. I could not take him too far from the camp as we were in a state of ‘active service’ and the danger of terrorist attack was a real one. A feature of his character, which remained constant, was the effect that other horses had on him. His years as a stud stallion had become too ingrained in his personality to be changed by the ‘Cordon Bleu’ treatment I was giving him. I was never able to take him anywhere near the other horses in the stables and as a result I became a ‘lone ranger’ as nobody could accompany me on a ride. He continued to live under the big tree by the Contractor’s shop, which was ideal for him during the summer months. 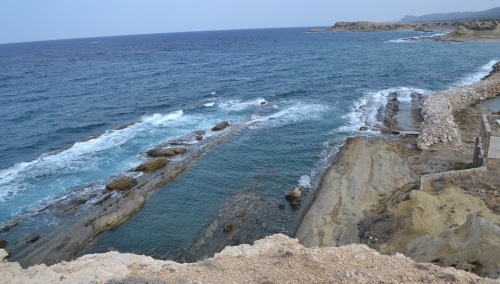 After six month’s service in Dhavlos, the time came for us to leave the Karpas peninsula and take up residence in Dhekelia Camp near Larnaca on the south-east coast of Cyprus. There was no problem about taking the other two ponies with us, they were quite manageable and had already become seasoned travellers. Satan was a problem though and the prospect of putting him in the stables at Dhekelia, where there were plenty of ponies and a flourishing Polo Club, was quite out of the question. I suppose that I could have sent him back to Akrades but, with all his faults, I had become attached to the old rogue. By ‘horses’ he meant ‘mares’ and it was obvious that he had his eye on Satan as the father of some sturdy foals and fillies he hoped to raise. I was delighted with this splendid solution to the problem and I told Nikos that he could have Satan as a gift the day we left Dhavlos. Nikos was a courteous old man and he had looked after us well during the time we had spent in the camp alongside his village. He was always pleased to prepare local recipes for us and to this day I delight the taste buds of my family with his special way of cooking octopus with garlic and red wine. The day before we left our lovely camp by the sea, I took Satan out for our last ride. His coat was now sleek and shiny and the big hollows in his side had gone. He held his head high and tossed his mane at the prospect of a good gallop on the beach. It was hard to imagine that this was the horse that had been in such poor condition only a few months before. Dicky Randell had been right and had recognised the potential of the animal. I was busy getting my soldiers ready for the move on the day we left Dhavlos, so my batman took Satan to his new home. When all was ready and the soldiers were aboard the trucks, I gave the order to move off. As we headed out on the dust road to Khomi Kebir and beyond, I leaned out of the window to take a last look at the Louis Hotel and the collection of tents around it, now occupied by a Royal Artillery Field Battery. At the eastern perimeter of the village I saw the whitewashed stone house where Nikos lived with his wife and two daughters. In the adjoining field three mares were gently swishing their tails under one of the broad-leafed carob trees. 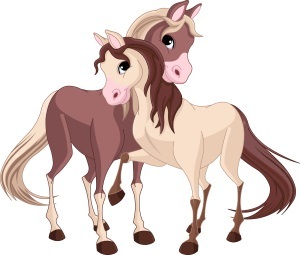 Standing with them and gently nuzzling the neck of a pretty little filly was Satan. He paused as we drove past and held his head high over his three companions. I gave him a wave and silently wished him a long and happy life. 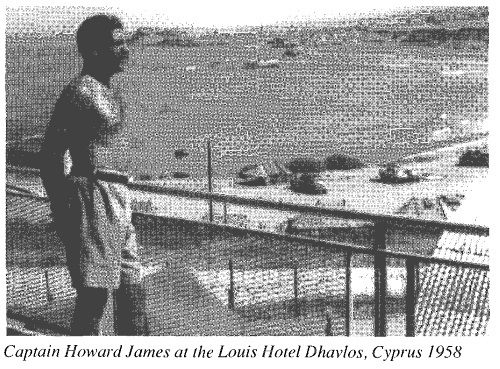 I found this to be a very amusing and interesting story and although the personnel who were posted to Cyprus during the Emergency had to be on alert at all times, there were some light-hearted moments and a great camaraderie among officers and servicemen alike. What wonderful memories Cyprus veterans have and thank goodness some of their memories have been recorded, not only in Cyprus but in other parts of the world where British servicemen were posted. 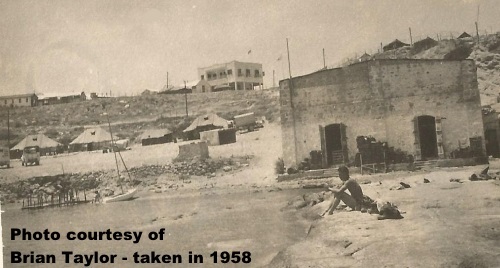 This entry was posted in British friends, Friends Pages, Information and tagged Buyukkonuk (Komi Kebir), Cyprus, Kaplica (Dhavlos), Major Bob Smith, Men of Harlech Regimental Journal, Welch Regiment in Cyprus. Bookmark the permalink.